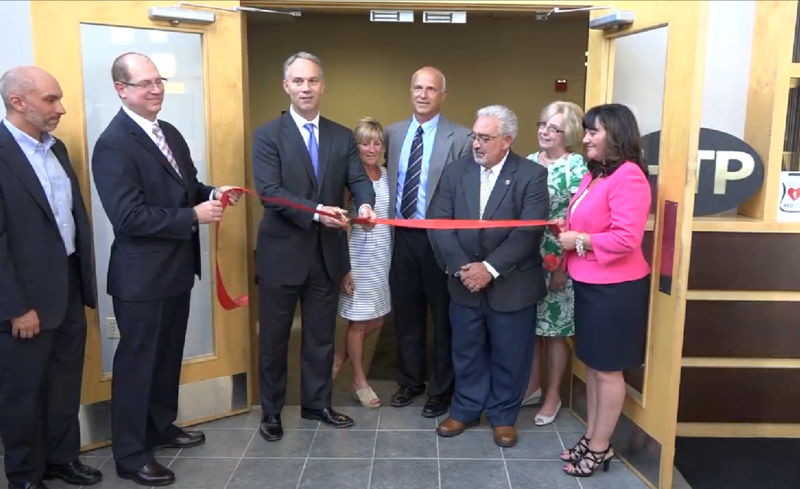 On Wednesday, August 12, New Bedford Mayor Jon Mitchell cut the ribbon at HTP's grand opening ceremony. The ceremony took place at 4:00 p.m. in HTP's foyer. A crowd of media and business representatives as well as HTP employees gathered around as Mayor Mitchell welcomed HTP to the New Bedford Business Park with a thoughtful speech. "It is big news that a company of this scale ... would move its headquarters to our city," Mayor Jon Mitchell said. HTP currently employees 155 people and hopes to add 40 more over thext five years. "There are between 3 and 4,000 people working here at the park and this is probably the epicenter of manufacturing jobs in the city of New Bedford," said Liz Isherwood, President of the New Bedford Industrial Foundation. Dave Davis, CEO and owner of HTP also gave a speech before cutting the ribbon with Mayor Mitchell. "New Bedford is the right place to be. Our employees come from New Bedford. We have great employees, it's a great location. We can have future growth with our company," Davis said.